Max. h.p. at Engine Crankshaft: 52 at 1,600 engine rpm. Max. h.p. at PTO Shaft: 25 (722 rpm) at 1,600 engine rpm. Max. h.p. at Drawbar: 40.1 at 1,600 engine rpm. Max. Crankshaft Torque: 162 lb/ft at 1,200 engine rpm. Max. Drawbar Pull: 11,020 lb at 1.364 mph on 14 in. tracks. Total Tractor Test Weight: 11,732 lb. Engine: Ford Model 592E, 4-stroke, Water cooled diesel, Cylinders = 4, Bore = 3.937 in. Stroke = 4.528 in. Displacement = 220.27 cu. in. Compression ratio = 16.1:1, Operating speed range = 550 to 1,900 rpm. Standard Speeds: Forward = 1.36, 1.78, 2.38, 3.28, 4.41 mph, Reverse = 1.71, 3.07 mph. Standard Tracks: Tread (centre to centre) = 53 in. Width = 14 in, Length on ground = 54.5 in. Turning Radius: 13 ft, Ground clearance = 11 in. OVERALL DIMENSIONS: Length = 129.5 in. Width = 67.5 in. Weight (as sold, without ballast): 10,107 lb. PTO: Spline shaft, diameter = 1-3/8 in. Rotation, Clockwise, Viewed from rear. Hydraulics: Maximum pressure =1,100 psi, Front mounted, 2,250 psi inbuilt; Pump capacity = 13.0 and 4.93 gpm respectively. Implement Attachment: Category = 1 and 2 linkage, Maximum lift at hitch point = 3,000 lb. 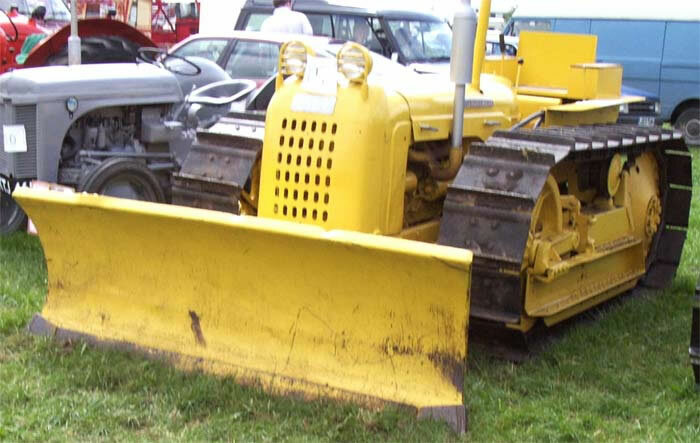 Additional Equipment Available: Hydraulic dozer, Raised PTO, Remote hydraulics.